With each new member, Bulc Club’s Member Ratings grow stronger and more accurate. By default, Bulc Club relies on these ratings to determine if we should forward emails to you. With enough members, we’ll rid the world of bulkmail forever. In the meantime, it’s possible that some bulkmail will slip through to your inbox. Bulc Club shows you the sender’s real, original email address and mail server domain at the top of every message we send, and provides options to block either (or both). Most mail clients only show the spoofed address, which could deceive you into believing the email is safe, particularly if the email address they provide is from a phished address book, belonging to a family member or friend. The original address and domain in the Bulc Club email header are linked to our Check Rating feature (available to members and the public), allowing you to easily discern if the sender has been deemed a bulkmailer by our members. If you think a sender is questionable, we recommend checking their rating before you click any other links in the email. 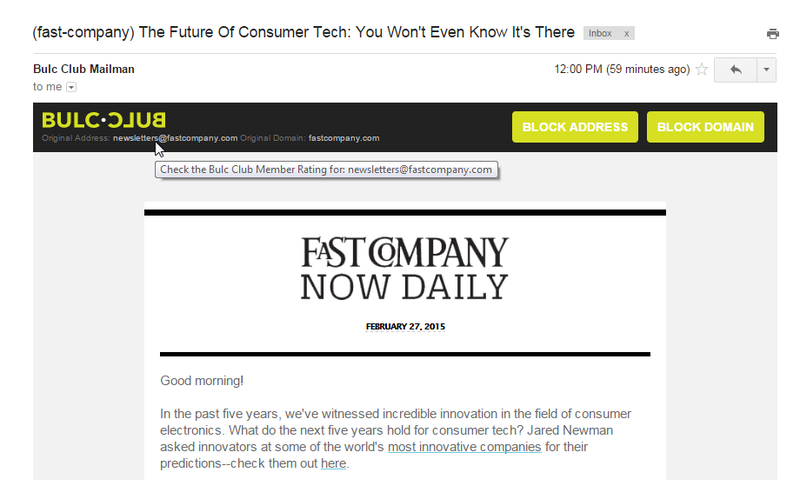 Clicking links in email from bulkmailers may subscribe you to additional spam lists. Log-in to your Member Console and click the Forwarders tab. Click the Action drop-down beside the forwarder used to send you the email and select Statistics. From these pages you’ll be able to see a list of email addresses and domains that have written you with this forwarder. If there is only one of each, the chances are pretty good that the email is from a valid sender—the person to whom you provided the forwarder in the first place. If there are multiple email addresses—and you don’t recognize some of them—the one that you DO recognize is probably the person or entity that shared/sold your forwarder. Simply disable it and you’ll never receive bulkmail from them again. Or, better yet, click the “Block Address” action in your History tab to reduce the chances of any of our members receiving bulkmail from them again. Never click the unsubscribe link for senders of questionable origin. 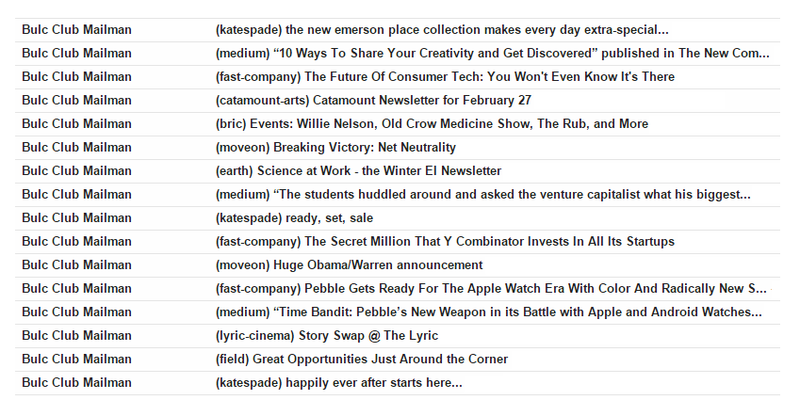 These links could inform bulkmailers that your inbox is active and they could add you to additional spam lists. Bulc Club helps protect you from scams, identity theft, and the endless frustration of a cluttered inbox. If you have any questions about Bulc Club, read our Frequently Asked Questions (FAQs), or drop us a line. We’re eager to help!